Whether your plants are indoor or outdoor, at home or in the office, these self-watering spikes will keep your plants alive by delivering just the right amount of water to them preventing water overflow. Grow healthier plants by preventing over or under watering. 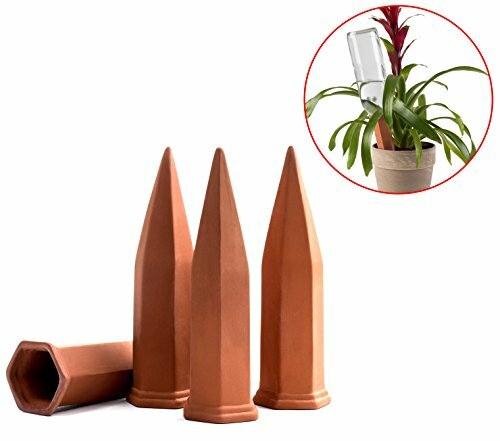 Use recycled wine bottles along with these amazing Terracotta plant watering Spikes to create a self-irrigation watering system. Travel more without having to worry about finding Someone to water your plants. As the water begins to run out, just refill the wine bottles so that your plants stay hearty and robust. This set makes a perfect gift for first-time gardeners or Potted plant owners. Order yours today! If you have any questions about this product by Modern Innovations, contact us by completing and submitting the form below. If you are looking for a specif part number, please include it with your message.